It is through our relationships that we so often suffer. And through our relationships we also, often, find new strength, power, and resilience. Has this always been so? 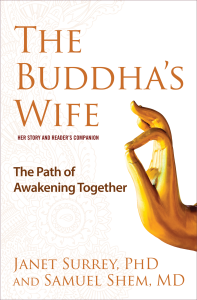 The Buddha’s Wife begins by offering “Book One: Yasodhara’s Story,” re-creating the events of her life along with her attendant insights and transformations. Both in the community within the royal palace and then among the Buddha’s followers, Yasodhara plays a cen­tral role: she is a figure who builds relational bridges and expands boundaries. The power of her relationship with Pajapati, forged in the time of extreme suffering after Siddhartha left, set in motion this relational path. From the evocative scenes of Yasodhara’s life, the book distills the wisdom of her path. It traces how her teachings are being made visible today and can be applied to all manner of contemporary suffering— from the stresses of relational losses and ruptures, the concerns of parenting and caregiving, and the pain of illness and grief over the betrayal and loss of loved ones, to domestic violence and substance abuse, social and cultural systemic violence, global inequalities, oppression, and environmental catastrophe. One of our first teachers and colleagues, psychiatrist Jean Baker Miller, described in her groundbreaking book Toward a New Psy­chology of Women how women have been the unseen “carriers” of care, nurturance, and compassion in Western culture.2 This domain of care and compassion has been relegated to the private domestic sphere, hidden—even “invisible”—and both trivialized and idealized by the dominant culture. Yasodhara, calling out in the pain of being left as so many others have done, was calling forth the immense power of compassion that flows in ordinary relationships. The depth of her suffering, her cry of pain, was a step toward the doorway opening to a well-worn, proven path. We believe this path has great, untapped potential—the path of awakening in relationship. Siddhartha chose to leave and go forth alone on what, at his time, was recognized as the traditional spiritual path. He left home and “went homeless” to live the holy life and to find a way through the suffering he had observed, seeking liberation. And through his own awakening, he would then chart a path of awakening for all beings. With Siddhartha’s leaving, Yasodhara experienced immense suf­fering at her core for the first time and called out for help from her women, beginning the process of healing in relationship, until she herself began to show up and accompany others, including men, as a beneficial presence. We imagine that all of us who walk with her, in the process of communion with shared suffering, might find a way of liberation together too. This is not simply what is known by Buddhists as the “householder” path—distinguished from the “monastic” path of monks and nuns—but a path considered unlikely to lead to true awakening. Yasodhara’s relational path has been hid­den within “domestic life” as well as within spiritual communities. Not simply for householders, and not only in domestic realms, the relational path has the potential to evolve into a revolutionary, shared awakening in all realms of life, as it is made visible and is explored in our time.